The new 4" Natural Arkansas Sharpening Stone from Smith's Abrasives removes modest amounts of metal as it polishes the cutting edge. No other type of sharpener can perform both these functions simultaneously! The new 4" x 1" sized Natural Arkansas stone is mounted on a plastic base and has a plastic lid to protect the stone when not in use. 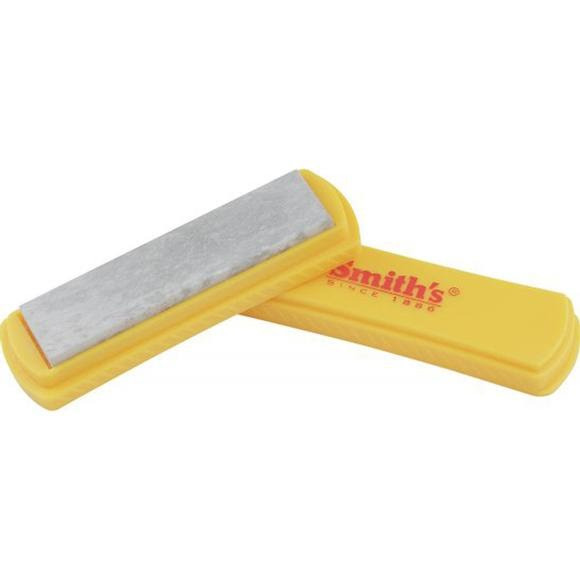 The new 4" Natural Arkansas Sharpening Stone from Smith&apos;s Abrasives removes modest amounts of metal as it polishes the cutting edge. No other type of sharpener can perform both these functions simultaneously! The new 4" x 1" sized Natural Arkansas stone is mounted on a plastic base and has a plastic lid to protect the stone when not in use. During use, the plastic lid can be inserted into the bottom of the stone base to extend the height of the base and make sharpening your knife safer. The user&apos;s fingers grip lower on the base and remove any chance of cutting your fingers when pulling or pushing the knife&apos;s cutting edge across the sharpening surface.